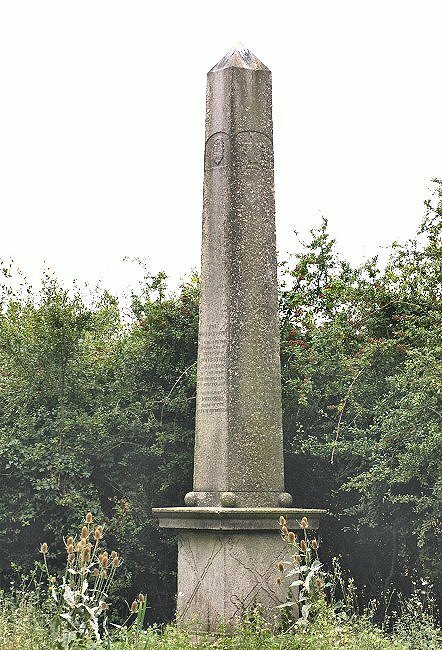 Obelisk located near the Dung Wharf at Lower Higham on the Thames and Medway Canal, map reference TQ 7173. Photograph taken from Canal Road on 26th August 2008. The Thames & Medway Canal was officially opened throughout on 14th October 1824. It offered the prospect of reducing the 47 mile journey by vessel between Gravesend and Strood to just 7 miles. However this proved to be of little advantage because boats were unable to enter or leave the canal via the lock gates for a few hours at each high water. 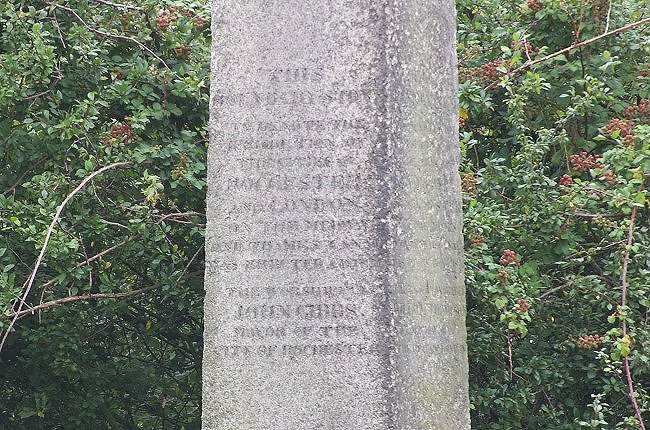 A closer view of the inscription. The words are somewhat unclear in the photograph, but are reproduced below. 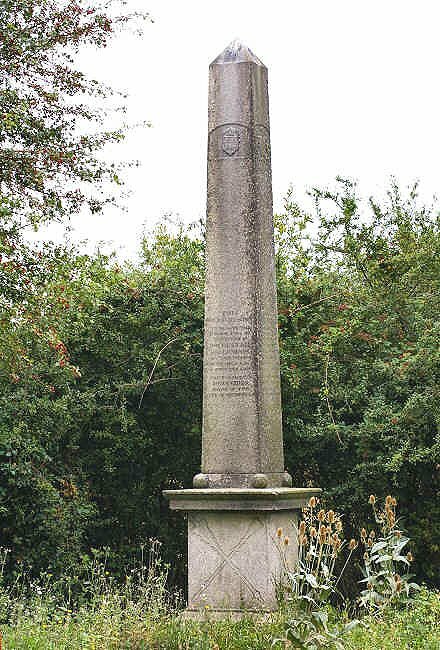 "This boundary stone marking the line of jurisdiction of the cities of Rochester and London on the Medway and Thames Canal was erected AD1820. The Worshipful John Gibbs Mayor of the city of Rochester." 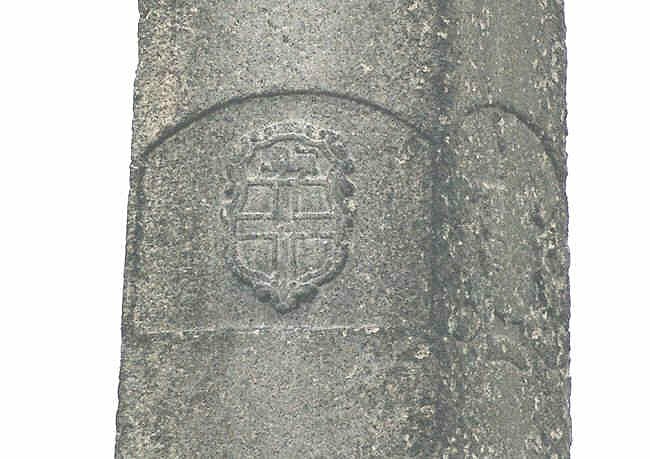 The coat of arms near the top of the monument. Photograph dated 26th August 2008. The canal was not commercially successful and a railway was built beside much of its route. In the Strood Tunnel the railway was built on wooden staging over the canal. The company name was amended to the Gravesend & Rochester Railway and Canal Company and the first train ran along the route on 10th February 1845. In 1846 the railway was sold to the South Eastern Railway Company. The railway line through the tunnel is still in use today. You may be interested to explore the Ships catalogue of books on ships and canals. The obelisk as seen from a slightly different direction. Photograph dated 26th August 2008. The section of canal through Strood Tunnel was filled in and the railway was laid directly upon the infill. The remainder of the canal continued in use until it was finally abandoned in 1934. Parts of the canal, such as the section adjacent to the obelisk, still contain water. The canal route can clearly be seen from passing trains as it is adjacent to the railway line between Gravesend and Hoo Junction, on the north side of the line.